These bookmarks are simply made from artwork that you are willing to cut up, along with two pieces of clear contact paper to make the bookmark sturdy. This is a great way to recycle your less-than-perfect artwork or preserve your child's treasured drawings. 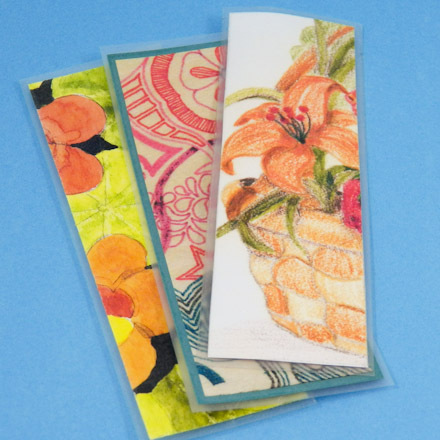 These bookmarks make great gifts, too! This project is well-suited for family, group or classroom craft time. With a little preparation by the adult or teen leader, this project will go quickly. Related craft: See how to creatively use those craft paper leftovers in the Punched Bookmarks craft project. Gather the materials needed for making the bookmarks. If you are doing this project with a group of children, pre-cut the clear contact paper (self-adhesive vinyl) to size. Find colorful artwork that you are willing to cut into pieces. Sometimes a piece of art has one good section that you might like to preserve, but the rest isn't that pretty. Kids' finger-painted pictures sometimes look very nice when cut into rectangles, but don't use any that are very thick with paint. Magazine pictures can also be used, but will need plain colored construction (or computer) paper glued to the back before being encased in clear contact paper. 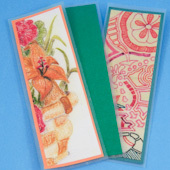 Measure and mark the backs of artwork pieces into rectangles of bookmark size—1½" by 5" (4 by 12 cm) is a good size. Cut out the bookmark carefully. Tip: Two rectangles can be glued back-to-back to make a reversible bookmark. Or cut and glue construction paper to the back for another look. Cut out two rectangles of clear contact paper for each bookmark. These should be ½" (1 cm) wider and longer than the cut artwork—2" by 5½" (5 by 13 cm). Remove the backing from one piece of contact paper and carefully center the artwork rectangle on the sticky side. Press down. Remove the backing from the other piece of contact paper and carefully place it on the other side of the artwork, making a sandwich. Smooth out any trapped air bubbles using the edge of the ruler. If the edges of the contact paper are not even, they can be trimmed slightly. Using the pencil and ruler, draw a straight line as a cutting guide, then carefully cut along the line. Your bookmarks are now complete! Thanks to Janet LaFara for sharing this craft idea with Aunt Annie's Craft Exchange in 1996. See one of Janet's original bookmarks to the left. Tip: A piece of artwork can be cut into several bookmarks. 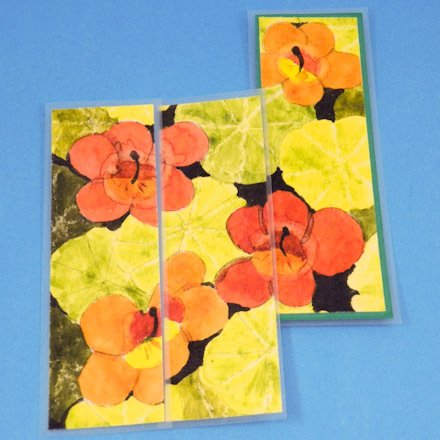 Tip: Solid-color construction paper or cardstock can be glued to the back of the cut-up artwork. This gives the bookmark a more finished look. 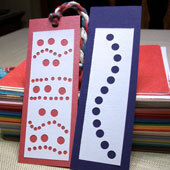 Related project: To make these Punched Bookmarks, hand the kids some pre-cut paper and a hole punch. Let the creativity flow!